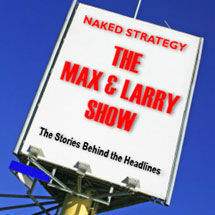 Naked Strategy is a bi-monthly x-ray for business leaders. Presented by Laurence Haughton and Max McKeown, the show shines the spotlight on the strategic issues that lurk behind the business news headlines. If you think that it is irreverent and perverse - that's great! Naked Strategy's mission is to illuminate, to connect the dots that link what we read and are told with what is really going on at work and in the world. Laurence Haughton is a writer, speaker, and a management consultant specializing in strategic execution. He is the author of "It’s Not What You Say... It’s What You Do – How Following Through at Every Level Can Make or Break Your Company" and co-authored "It's Not the Big That Eat the Small...It's the Fast That Eat the Slow", the bestselling book on making speed a competitive advantage in business. Max McKeown is Europe's unorthodox answer to Tom Peters. He works as a strategic adviser for four of the five most admired companies in the world and is a well-known speaker on subjects including innovation, engagement, human potential, customer experience, marketing, team building, and competitive advantage. Max has written six books, including "E-Customer, an insight into evolving customer behavior", "Why They Don't Buy", an end to end guide to building profitable customer relationships across multiple channels, and "Unshrink, featuring the myths that stop our people doing their best work and a set of new principles to engage their interest and ability. In the latest Naked Strategy, Max McKeown and Laurence Haughton discuss the Sub-Prime crisis and wonder how such smart people bought so many bad loans, how many people will lose their homes, and how many CEOs will give back their multi-million dollar bonuses? Lessons learned: something for nothing only works for those who get theirs early!